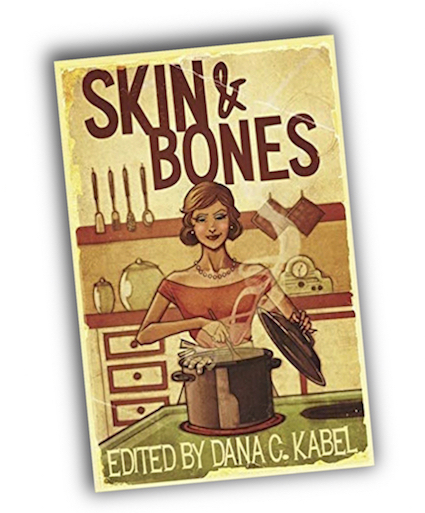 My story “Black Friday” will appear in the #cannibalnoir-themed anthology Skin & Bones edited by Delicious Dana C. Kabel, due out November 26, 2018. The anthology features anthropophagical tales by hunger artists such as Pleasing Patti Abbott, Aperitive Charles Ardai, Lip-Smacking Lawrence Block, Crumb-Coated Joe Clifford, Ambrosial Angel Luis Colón, Gratifying Glenn Gray, Tasty Tim Hall, Reduced Rob Hart, Tender Tess Makovesky, Mashed Terrence McCauley, Marinated Marietta Miles, Saucy Stuart Neville, Piquant Thomas Pluck, Sweetened Ryan Sayles, Spicy Suzanne Solomon, Savory Jason Starr, Scrumptious Liam Sweeny, Zesty Dave Zeltserman, and moist me. The book also features a story by the late Bill Crider, who was one of the nicest and most charming members of the mystery community. Orlando said this looking at Marcie and her eyes popped open like kernels of popcorn. Plop! Plop! He would’ve busted out laughing but there was a knife in his hand. Her parents—her dad in the wheelchair, dead from the waist down, depressed as hell, who wouldn’t be?—had generously, silently allowed Orlando to do the carving. Mrs. Arens—“Call me ‘Mom’”—she was the one who actually handed Orlando the carving knife. Dad (“That’s ‘Mr. Arens’”) wouldn’t touch it.